1. Omics analysis of publically available data towards efficient drug repurposing in Alzheimer’s disease. 2. A network-based approach for multi-source data integration in Huntington's Disease. 3. Neurodegenerative markers in HD: Association with clinical characteristics, triplet expansion, phenoconversion and Mediterranean Diet Adherence. 4. Multisource data integration using a network-based approach for the generation of clusters of connected pathways in Spastic Ataxia and other GBA2-associated diseases. 5. Genetic Susceptibility to Triple-Negative Breast Cancer in Cyprus; in patients tested negative for BRCA1/2 germline mutations. Zanti M., Loizidou MA., Michailidou K., Pirpa P., Machattou C., Markou Y., Kyriakou F., Kakouri E., Spyrou GM., Kyriacou K., Hadjisavvas A. 6. Genetic Susceptibility to Triple-Negative Breast Cancer in Cyprus. 7. Network-based approaches to integrate multisource information for Multiple Sclerosis towards biomarker discovery. 9. Clusters of connected pathways through multi-source data integration in Huntington's Disease. 10. Metabolites and Huntington's Disease: Preliminary results of a case-control study. 11. Genetic Susceptibility to Triple-Negative Breast Cancer in Cyprus; an NGS panel-testing approach. Zanti M., Loizidou MA., Michailidou K., Pirpa P., Machattou C., Markou Y., Kyriakou F., Kakouri E., Kyriacou K., Hadjisavvas A. 12. Interaction network between known breast cancer susceptibility genes. Zanti M., Loizidou MA., Michailidou K., Kyriacou K., Hadjisavvas A. 13. Classifying Variants of Unknown Significance by Combining Polygenic Risk Score and Network Analysis. The 6th International Conference of the Cyprus Society of Human Genetics, Nicosia Cyprus 24-25 Nov 2017. 14. Novel Maternally Imprinted Defects In The MKRN3 Gene In Patients With Familial Central Precocious Puberty. 10th International Meeting of Pediatric Endocrinology, Washington USA, September 2017. 15. Network Based Approaches for Classifying Variants of Unknown Significance. Oulas A, Minadakis G and Spyrou GM. 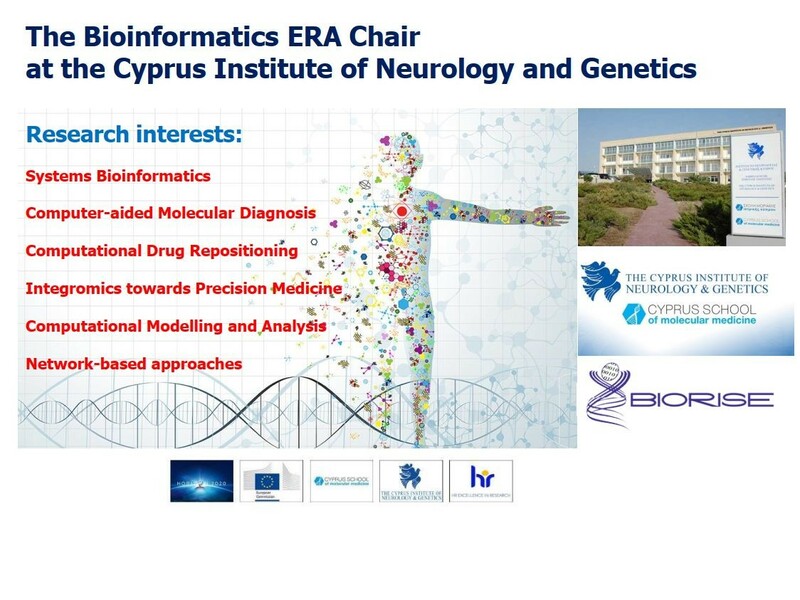 Hellenic Bioinformatics Conference, 6-9 September 2017, FORTH, Heraklion, Greece. 16. Gene Co-expression Network Analysis on Mantle Cell Lymphoma Transcriptomics Data Sheds Light on Novel Diagnostic, Prognostic and Therapeutic Strategies. Seitanidou C, Skrempou G, Psatha K, Oulas A, Drakos E, Spyrou GM and Aivaliotis M.